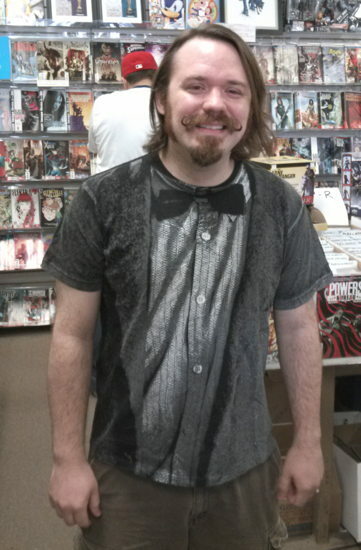 Well, that’s another Free Comic Book Day down, plenty of comics given away, plenty of stuff sold to help pay for the comics that were given away, and lo, the clean-up did begin, and last for thirty days and thirty nights. My first clue that this was going to be a busier-than-usual FCBD was when I showed up at 8 in the morning to prep, we already had several people waiting outside for us to open our doors. 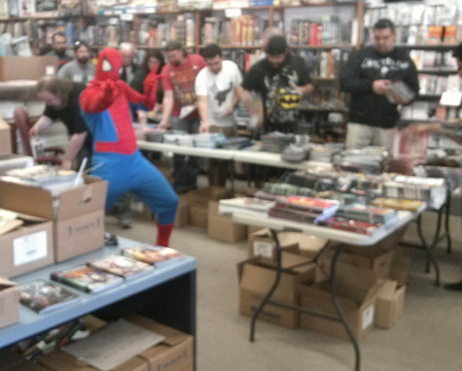 In the past I’ve noted that when I’d open up for FCBD, there would be a brief moment where it looked like nobody would show up, that I ordered all these thousands of comics for nuthin’, nuthin’ and then the crowds would eventually build up to expectations after just a few minutes. Not this time…soon as that door was unlocked a sea of people swept into the shop and we were packed for several hours after that. 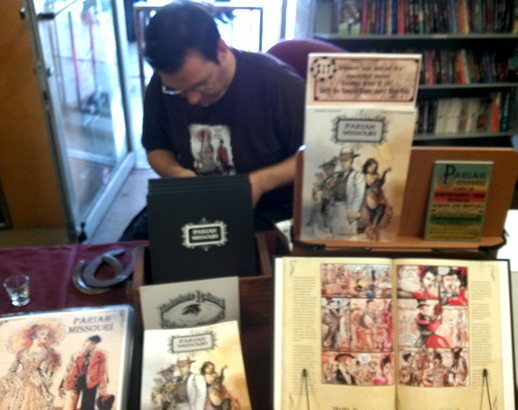 And I wish I’d taken more, or at least better photos, but it was an enormously busy day, and it seemed like I spent a lot of time helping folks find a bunch of back issues. Which is great, of course…always glad to see people looking for fun work from the past, not just stuff that’s New This Week. And so on. As it turned out, the mother looked through some of the Batgirl comics in the bins, and since DC hasn’t published a Batgirl comic for little kids in quite some time, she didn’t feel they’d be appropriate. Fortunately, I was able to find one of the Batman Adventures comics (based on the cartoons) that starred Batgirl, and I was Hero of the Day for, you know, at least a little bit. There seemed to be a lot of little kids visiting the shop throughout the day, evenly mixed between boys and girls, which was nice. Always happy to see children excited about comics. Saw at least a couple of young’uns in costume, one dressed as Supergirl, another as Wonder Woman. The actual stock of FCBD books lasted a good portion of the event…by about 3 or so we were down to about a couple dozen different titles, and by the end of the day we had a few leftovers of the DC and Marvel books, and of the Valiant “custom logo” title, as those were the ones of which we’d ordered the most. Throughout the day we supplemented the FCBD stock with that box or so of extras from last year, and some of the 10-cent/25-cent/99-cent/$1 promo comics Marvel, DC and Image had produced over the years that we still had in backstock. Plus, I thinned out a bunch of the FCBD books from my personal collection and graciously, selflessly gave them away as well. No need to thank me. Also, Awesome Hospital ‘s Matt Digges visited and brought us doughnuts. Well, he brought me doughnuts, I don’t know what he brought anyone else. 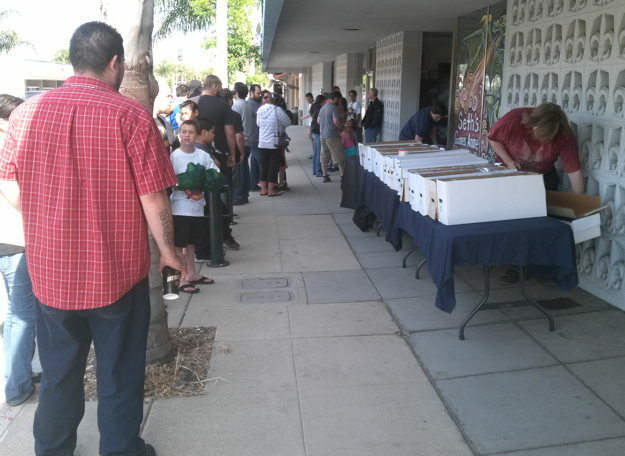 Ultimately, it was yet another successful Free Comic Book Day for us. 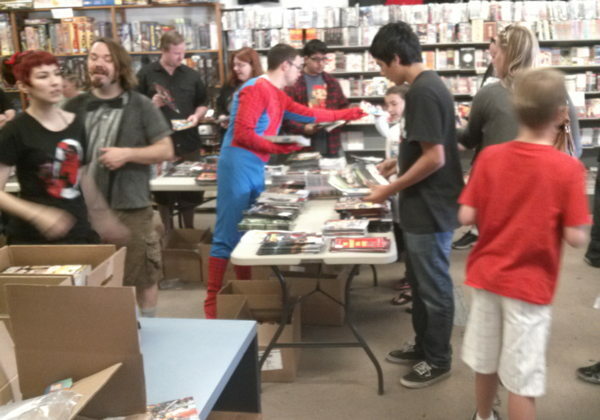 Our sales more than covered the costs of the FCBD books, we gave away a lot of comics, we saw plenty of new faces, and we made many people happy. 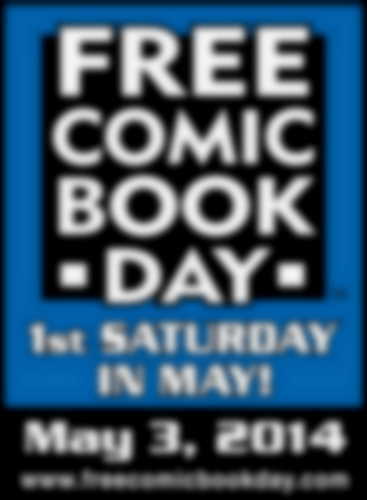 People always ask “does FCBD actually help?” and I think, in the long run, it does. It reminds people that comics exist, that they’re more than flying guys in tights punching each other (though those comics are fun, too! ), and that there are stores out there who love comics so much, they actually want to give you a bunch of them for free to try out. And that, if they want more comics, they know where to find them. And then, after working Free Comic Book Day, your pal Mike went to the late show to see Amazing Spider-Man 2 , so if you saw him looking worn out and sleepy on Sunday, please forgive him, because he’s clearly too dumb to know any better. since DC hasn’t published a Batgirl comic for little kids in quite some time, she didn’t feel they’d be appropriate. And this is why I hate DC so, so very much. Our local comic book store actually has a really good selection of kids graphic novels, and my son and I were looking for things to buy. He wanted a Superman book – we already had Superman Family Adventures, and the other Superman books were chapter books not comics (he really wanted a comic). Okay, then Batman – we already had the Batman Brave and Bold collections that were there, and the other Batman books were chapter books not comics. Okay, then Wonder Woman (he’s on a Justice League kick). There were literally NO WONDER WOMAN COMIC BOOKS FOR KIDS. WTF DC? You’ve got a freaking Superhero Princess With Magic Powers and you aren’t marketing anything for kids with that? Are you people STUPID? Anyway, he switched to Avengers and we found a whole bunch of Super Hero Squad and Marvel Adventures collections for him to pick from, so at least one of the big two companies remembers that they need to convince kids to actually read comics if they want to have readers 10 years down the road after us old guys die of rage-induced heart attacks after the next line-wide reboot gone wrong. Took my infant daughter to FCBD. A girl dressed up as Black Widow and a girl dressed up as Madame Hydra both fell in love with her immediately, much to the dismay of the guy dressed up as Captain America, who had been the subject of their attention moments earlier. 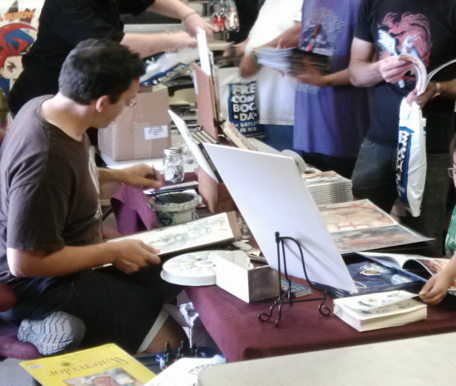 Pretty much the only thing I was there for was the Uncle Scrooge/Donald Duck book. I picked up the tie-ins to the Guardians of the Galaxy movie and the Archie digest, but that was about it. Then I went inside and showed my daughter all of the comics she’d one day be into. Which is when I struck me how disinterested I was in her ever getting into the vast majority of comics. For me these superhero books were neat, but ignoring my own old man coot-ness and the possible qualitative difference between then and now, as a guy who looks back on what he read and kind of winces, they and the culture surrounding them are just not what I’d want my daughter getting into. I do wish DC was willing to capitalize on some of their characters, like a Batgirl, like Wonder Woman, like Black Canary or Power Girl (yes, yes, it might take some work), who have the capacity to showcase comics I wouldn’t wince to have a 9 year old girl read. It’s not like Marvel didn’t have some success with Miss Marvel, though even that’s a rare bird and we’ll see if in three years she’s as hot and exciting a property as Arana. At least we’ll always have Nancy. My son didn’t care about most of the free comics. He likes DC characters, mostly, and thought their offering looked bad. He got the Mouse Guard sampler & I picked up Uncle Scrooge and Transformers vs. GI Joe. Both were ridiculously entertaining. I’m not surprised Uncle Scrooge was good because Don Rosa, but I can’t get over the fact that I really, really want to read more Tf vs. GI J comics RIGHT NOW. Well done, Tom Scioli & friends. What made my son happy was an issue of Justice League International. He likes Guy Gardner, Fire, Ice, and other c-listers. I wouldn’t have looked twice at the book (which turned out to have some nice Eduardo Barreto art) because it was post- Giffen/ DeMatteis and pre-Morrison, but my son loved it. Let me join that chorus: my 9 yoa daughter grabbed Dumbest Idea Ever, Avatar, Adventure Time, and Teen Titans Go. And I think, going by how she loved Supergirl: Adventures in the 8th Grade, that if DC had a Batgirl comic in the vein of the Nancy Drew Mysteries, she’d read it.